We welcome you to Visage Skin Care & Laser Center, a division of Robinson Facial Plastic Surgery, located in our Alpharetta office at Northside/Alpharetta Medical Campus. Our goal is to provide the safest laser procedures along with the most effective medical-grade skin care treatments and products available. The benefits of this unique relationship between beauty, medicine, and wellness are unrivaled. 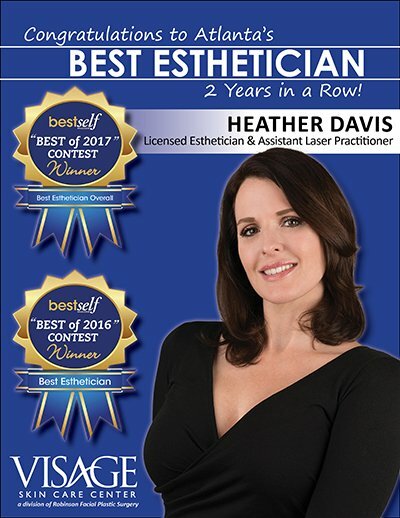 Heather Davis, LE is an NCEA Certified Esthetician & Assistant Laser Practitioner with over 20 years of experience and voted “Best Esthetician” for 2 years in a row by the Atlanta community. Invest in your skin…it’s going to represent you for a long time”.